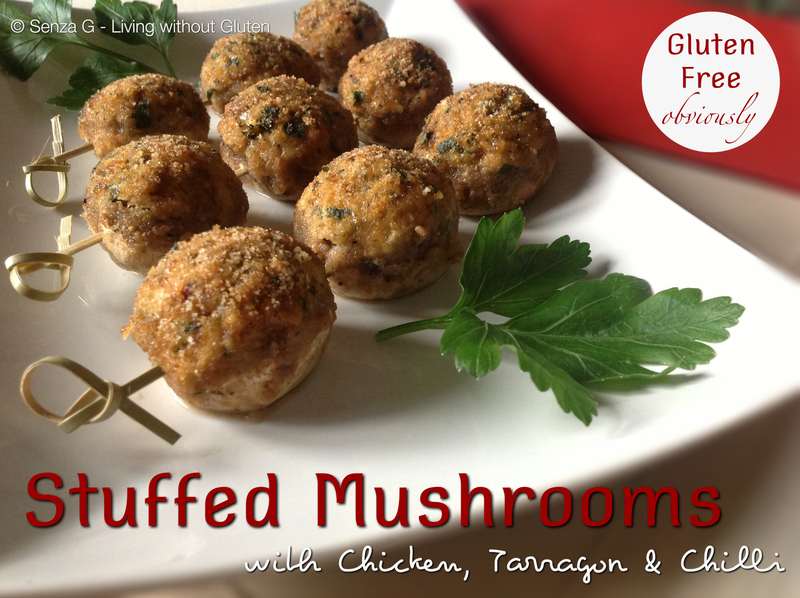 These mushrooms are so delicious … creamy, cheesy and spicy ! A perfect recipe if you have any leftover chicken. They would also make a great starter! Choose mushrooms that are similar in size – approximately 2 inches in diameter or so. Below I have calculated for 6 skewers of three mushrooms each. Start by preparing the mushrooms. Wipe them down and remove the stem by wriggling it and it will easily come off. Chop the stems finely and set aside. Sautee the onion and garlic in a little oil or butter until softened. Season with salt, freshly ground pepper and chilli. Add the chopped up stems and cook until mixture is dry. In a bowl beat the cream cheese lightly, add the chopped chicken, the mushroom and onion mix, the tarragon and some Parmesan cheese. Combine well. In a separate small bowl, mix the Polenta granules with the remaining grated Parmesan cheese. Using a small teaspoon, fill the mushroom caps with the mix. Then sprinkle the tops with the Parmesan/Polenta mix. Do the same with all the mushrooms and thread three mushrooms on each skewer. Place on a lined baking sheet. Bake in a preheated oven at 180C for approximately 10 to 15 minutes. Be careful not to overcook. They should remain slightly firm.